The Tudor dynasty continued the Plantagenet line, albeit in a diluted form. The family was descended from the strongest Welsh clans; Owen Tudor, the first man to use the surname, was a direct eighth-generation descendent of Llewelyn the Great and Joan (daughter of King John ). Owen worked within the household of Queen Catherine, widow of Henry V ; Owen and Catherine married in 1429. Their first son, Edmund Tudor, was made thirteenth Earl of Richmond in 1453, and married Margaret Beaufort (great-granddaughter of John of Gaunt ) in 1455, creating yet another link to the Plantagenet line. Edmund and Margaret had one son, Henry, who would be made fourteenth Earl of Richmond and eventually become King Henry VII . The Tudor era marked the beginning of political and religious reform in England. 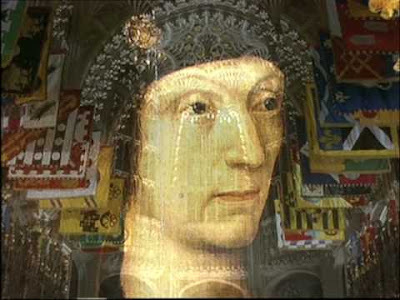 Henry Tudor, Duke of Richmond, defeated Richard III at the Battle of Bosworth and married Elizabeth of York (he was Lancastrian) to end the War of the Roses and politically stabilize the monarchy. Richmond, as Henry VII, brought the nobility to heel by economic means, revitalizing the monarchical strength which characterized all the Tudor rulers. 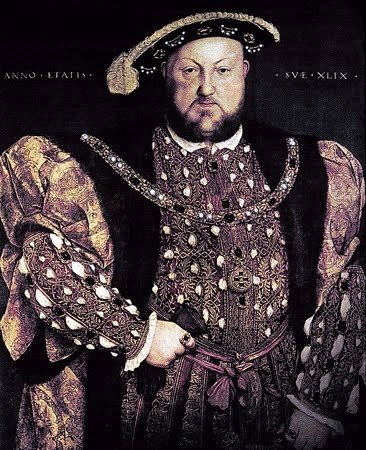 Henry VIII inherited a secure throne and was well-received by the general populace. Providing a male heir proved most difficult, resulting in Henry's search for an annulment from his first wife, Catherine of Aragorn. Failing to achieve a settlement with the Pope, Henry separated England from the Roman Catholic church; the result was catastrophic: religious strife that endured throughout both the Tudor and Stuart eras. The struggle to produce a male heir caused Henry to marry yet again, as his first two wives bore him daughter. This union finally produced a male - the future Edward VI . Henry married three more times, for a total of six wives. Edward VI came to throne upon the death of his father in 1547. He was a strong Protestant, further reforming the Church of England by eliminating Roman Catholic ritual from church services. Upon his premature death at age sixteen, Mary , the staunch Catholic daughter of Henry VIII and Catherine of Aragorn, inherited the throne. Mary's reign was marred by religious persecution on a grand scale: she reinstated Roman Catholicism and burned Protestants for heresy. The frail Mary died in 1558, her short reign lasting for but five years; Elizabeth , Henry's daughter by Anne Boleyn, inherited a kingdom divided between Catholics and Protestants, but had the political acumen to lead both camps to compromise. Modernization of medieval practices was a constant in Tudor England. Improved methods of collecting revenue and conducting state affairs utilized a larger bureaucracy of skilled officials. Protestant reforms placing the king at the head of ecclesiastical (as well as political) domain was a further catalyst to change. These two factors, combined with the confident manner in which all the Tudors ruled, produced a monarchy capable of directing the winds of change.